According to mythology, Aristaios, the son of Apollo and Cyrene, was sent by the gods to give the Greeks the gift of cheese-making. It was called a "gift of everlasting value." If the reputation of today's Greek cheeses is anything to go by, that value has increased with age. Greek cheeses are among the finest in the world. Many varieties have been accorded protection under the European Union's Protected Denomination of Origin (PDO) provisions. This means that no other EU member nation can use the name of a particular cheese and that these cheeses must meet processing and location-of-origin standards. Some are more commonly known than others. Feta tops of the list of Greek cheeses. Exported all over the world, it is highly regarded for its variations, from semi-soft to semi-hard and from mild to sharp. Only sheep's milk and goat's milk can be used to make feta—no cow's milk. It's a white curd cheese with a slightly salty taste from the brine that's used to make it. Feta is used in numerous ways: in baked goods, casseroles, appetizers, mezethes, with fruit, and as a table cheese. The 2005 EU court decision awarded the name solely to Greece. Only cheeses made in Lesvos, Macedonia, Thessaly, Thrace, central mainland Greece, and the Peloponnese can be called feta. Hard, salty cheeses like kefalotyri and graviera are enjoyed grated, fried, and served as mezethes and appetizers. Kefalotyri is made from sheep's and goat's milk. It's very hard, a yellowish color, and it tends to be dry. This cheese is typically aged for more than a year, resulting in its strong flavor. Think of it as a harder, sharper, and saltier version of Gruyere. Graviera cheese is immensely popular in Greece. It uses cow's milk in addition to goat's and sheep's milk and is sweeter than kefalotyri with an almost fruity taste. You might find subtle differences between one graviera and another depending on the region of Greece where it was produced. Kasseri is one of the few yellowish Greek cheeses, and it's a favorite table cheese. This one is soft and somewhat stringy. It has a somewhat buttery taste and a relatively high fat content. It's often used in omelets and baking. This cheese is made predominantly with sheep's milk and no more than 20 percent goat's milk. It's matured for at least four months to achieve its signature texture. Sweet cheeses like manouri and fresh myzithra are often used to create some of the best desserts this side of Mount Olympus. Manouri is a semi-soft cheese that is also known as manoypi. Authentic manouri is made only in Central Macedonia, Western Macedonia, and Thessalia under the EU's PDO provisions. It's made from a combination of milk or cream and whey, and it has a milky, almost citrus-like flavor. Myzithra, sometimes called mizythra, is an unpasteurized cheese usually eaten within a few days. It's often grated and used with pasta. In the world of Greek cheese, kefalograviera is a newcomer. First produced in the 1960s, it quickly became a favorite table cheese and is fabulous with ouzo or white wine. It can also be used in baked foods, grated over pasta, or pan-seared for a delicious saganaki. This hard yellow cheese has a salty, nutty flavor and is often compared to a cross between kefalotyri and graviera. It is made either entirely of sheep's milk or a combination of sheep's and goat's milk. 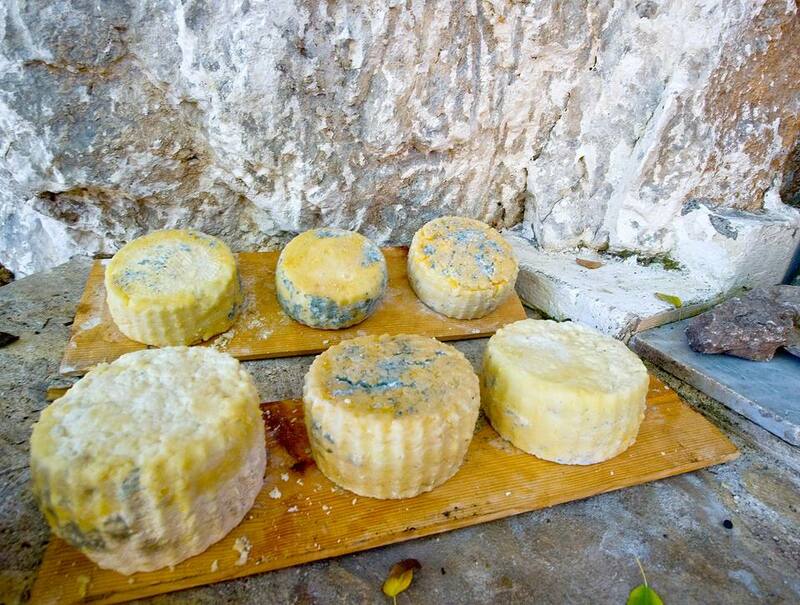 The cheese is made in the mountainous areas of Epirus and Macedonia and is aged for at least three months. Below is a list of all the popular Greek cheeses with their names in English as well as Greek letters, so you can spot them at the market. The pronunciation will be helpful as well (the accented syllables are shown in capital letters).